Description: Opening up after the 10 mph slow order through downtown. Description: P11 eases through town on a rare daylight appearance. Description: Crossing I-85 heading north for the double main at Lula. Description: Through the rolling hills at milepost NE 10. Description: Making a brake test at the Goldkist Feed Mill. Title: Southbound at Heaton St. Description: NS 041 glides through Jonesboro on a early and clear Tuesday morning. Description: NS 041 begins there trek to Cincinnati from the main at Noell Siding just south of Muncie. Description: The conductor waves at me as the NS 041 rolls south through Jonesboro. Description: NS FEMA train 041 departs Noell after meeting 144. Description: NS 144 is in the siding at Noell as NS 041 departs for Cincinnati. Description: A pair of GP-60's heads up NS 041 at the south end of Noell, or is it the east end? Description: NS GP60 7122 was the third engine on train 213 while D9-40CW 8910 was the middle unit. 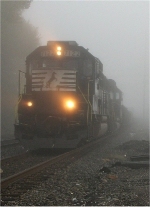 Description: A smudgy, smokin', NS, GP60 leads three others pulling an intermodal train into Spartanburg...in the rain! Title: Mostly Cloudy Morning With NS 212 @ 1020 hrs. Description: More NS GP60s pulling 212 east after sitting in Easton, Pa after stalled EB 18G was on the move again.